Blues manager Paul Lambert has reiterated his praise for striker Freddie Sears and midfielder Cole Skuse, the two standout performers during his time at Town so far. Sears, who was 29 on Tuesday, has netted four goals in Lambert’s four games, while Skuse has dictated play from central midfield. Former West Ham and Colchester man Sears twice went for spells of 38 games without scoring under Mick McCarthy and hadn’t found the net this season prior to Lambert taking over from Paul Hurst. Is the new boss surprised by Sears’s form given his previous lack of goals? “I can only comment on what I’ve seen from Freddie in the four games I’ve been here and he’s been brilliant. “I think he looks a different player. I don’t know why, what’s happened, you’re probably better asking him that but [he has a great] level of understanding the game that we’re trying to coach them, and coming in from the left-hand side he’s definitely a goal threat. He added: “I think he’s been excellent, I really do. I think the position suits him because he can come in on his right side. “He’s a very intelligent footballer, it’s not just his goalscoring but he’s a really clever footballer, he picks things up in training really quickly the way I ask of him, the movements and the angles we want him to receive the ball and I think that’s really important. 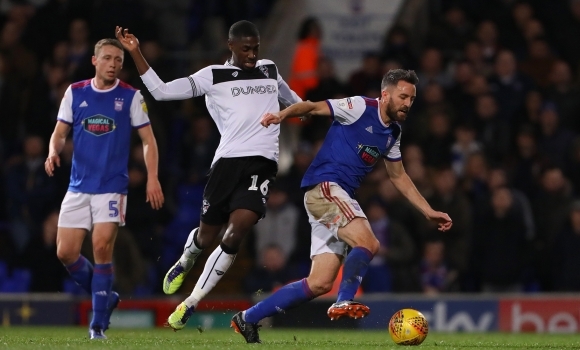 Regarding Skuse, 32, who is playing a more forward-thinking role under Lambert having been more of an out and out central midfield sitter under McCarthy, he said: “He’s played in the way I want the midfielders to play. "I don’t want somebody just to be destructive or not get on the ball. In that area of the pitch you’ve got to have people who are comfortable with the ball. “Like Freddie, I can only go by the four games I’ve been here and his passing is really, really intelligent and I think the way we’re playing at the minute the range of passing is exceptional. “Both feet, it’s not just his stronger right foot, both feet. He’s dictating the game and, as I said before, you wish he was a little bit younger, but he’s not. “But his actually performances have been unbelievably high, dictating games for us and his range of passing is exceptional. He’s another one who is on top of his game. “The lads who have been here the longest [have been brilliant], we’ve got a lot of lads here who haven’t even played in this division before. “Sears, Skuse, Chambers, Bart, they’ve played in the league, a lot of the lads haven’t played in the league. Certainly the best players on Wednesday...as for the majority of the rest, well some certainly need dropping i.e. our full backs, Chambers and possibly Chalobah whose form had dipped of late. Sears and Skuse looked absolutely brilliant on Wednesday. Despite the result, I thoroughly enjoyed watching it. Forward, positive play and some actual goals to celebrate. We've looked good in a lot of games, but have clearly lacked a striker who really knows where the goal is. But out of nowhere, Sears suddenly looks like that kind of player. What a joy to watch! We may be bottom of the table with just one win, but we can definitely compete in any game against any team in this division. Time to kick off a killer winning streak I reckon! Chambers is a decent CB but just want to see more of the Captain in him whilst ON the pitch as he is apparently exceptional OFF it. When we started and finished sluggishly, where was our Captain motivating. When Roberts was losing it on Wed where was the Captain to sort him out and calm him down. And most frustratingly, instead of getting his teammates re-focused he himself absolutely lost it in front of the SBR when Freddie got his second, and presumably had not yet caught his breath when he watched their equaliser roll in less than 1 minute later. Not a new issue of course, but we need leaders ON the pitch if we going to come through this period in whatever league we are in by then. Sears finally finding form has been the highlight of my season. There has always been a quality player hiding away in there and now he is beginning to flourish. Long may it continue... besides, we don't have anyone else to pin our goal-scoring hopes on! Skuse has anything but Skuseless lately. Mick Mills was singing his praises last match saying he's been playing some nice neat effective two touch football. And if only we could get somebody to gel alongside Sears. Roberts looked good the first couple of games Lambert gave him a surprise selection but sadly seems to have gone backwards the last couple of games. His goal scoring record isn't great at any level so I think we might need to consider somebody else alongside Sears before the January transfer window. I wouldn't mind seeing Folami getting a chance to play up top with Freddie. So good to see Skuse getting well deserved praise at last. He has been one of my favourite players for several years but vastly underrated by many. He is totally different class at breaking up opposition attacks - by far the best in the division and now that he is being allowed to play further forward, his range of passing is now coming to the fore. Look again at his long crossfield diagonal ball for the opening goal against Bristol - sheer perfection. Skuse has certainly improved, and Sears is now recovering from being messed up by MM.Long my it last.